A busy downtown scene in the late 1920’s finds car 116 on the Mandell line preparing to head outbound to the Montrose district. These cars, built in 1927, were the last series of streetcars ordered by the Houston Electric Co. The First Montrose Commons (FMC) Historic District is located within the greater Montrose area and comprises two distinct subdivision plats — the Lockhart, Connor & Barziza Addition, platted in 1873 (later re-platted into two sections, one section remaining in FMC), and the Bute Addition platted in 1907. While the FMC Historic District was originally platted as these two different subdivisions, over time they formed an individual identity, which has become known as the neighborhood of First Montrose Commons. The development of our neighborhood, especially that of the Lockhard, Connor, & Barziza Addition, was heavily shaped by two railroads that formed its northern and eastern boundaries at the end of the 19th century. In fact, the Buffalo Bayou, Brazos and Colorado (BBB&C) was Texas’ first railroad and first west of the Mississippi. It succumbed to bankruptcy after the Civil War and was rechartered as the Galveston, Harrisburg, & San Antonio Railroad (GH&SA) in 1870. The GH&SA built its own line into Houston, crossing through the eastern-most parts of the Lockhard, Connor, & Barziza Addition in 1880. In June of 1902 the Galveston, Harrisburg & San Antonio Railroad filed an official plat of Lot 16. A dozen freight and passenger trains ran daily along tracks that crossed from West Alabama and Jack to Richmond Avenue and Garrott Street. The Tewena stop was located east of Jack, near the entrance ramp to the Southwest Freeway. The second railroad west of the Mississippi River was the Texas Western Narrow Gauge Railroad (TWNG) and was the first narrow gauge railroad chartered in Texas. The Montrose Streetcar Line also shaped the neighborhood; with the extension of the South End line into greater Montrose, “suburban” neighborhoods, such as First Montrose Commons, were made viable. The intersection at Roseland and Branard (formerly named West Main) was the terminus and turnaround for the Montrose Streetcar Line. On opening day, August 18, 1912, hundreds of Houstonians gathered in bleachers to wait their turn for the inaugural run, heading north down Roseland, over to Hawthorne Street and then north again on Taft. A brass band provided entertainment while Snyder’s Ice Cream Company provided free refreshments. This line ran for nearly 25 years, the last car on March 13, 1937. By 1940, there were no more streetcars in Houston. Also contributing to Houston’s growth were people who moved from Galveston to Houston after the Great Hurricane of 1900 destroyed most of Galveston and severely limited shipping on Houston’s railroads from the Port of Galveston while it was reconstructed. A 1915 Galveston hurricane brought even greater numbers to Houston and the real estate boom was on for both commercial and residential development. The Lockhart, Conner & Barziza and the Bute Additions were part of this boom with the construction of many new homes and apartments. Montrose was the city’s first large scale, restricted planned suburban subdivision. It was platted in September 1911 by the Houston Land Corporation, owned by one of Houston’s most prominent businessman, John Wiley Link. Link named the area “Montrose” after the historic town in Scotland. To design his new subdivision, Link hired the engineering and construction firm of Stone & Webster, which had just finished building the interurban line between Houston and Galveston. Link made his home in the mansion he built at Montrose and West Alabama, currently known as the Link-Lee Mansion and serving as administration offices for the University of St. Thomas. The Mansion has been preserved and is a City of Houston Protected Landmark and listed in the National Register of Historic Places. 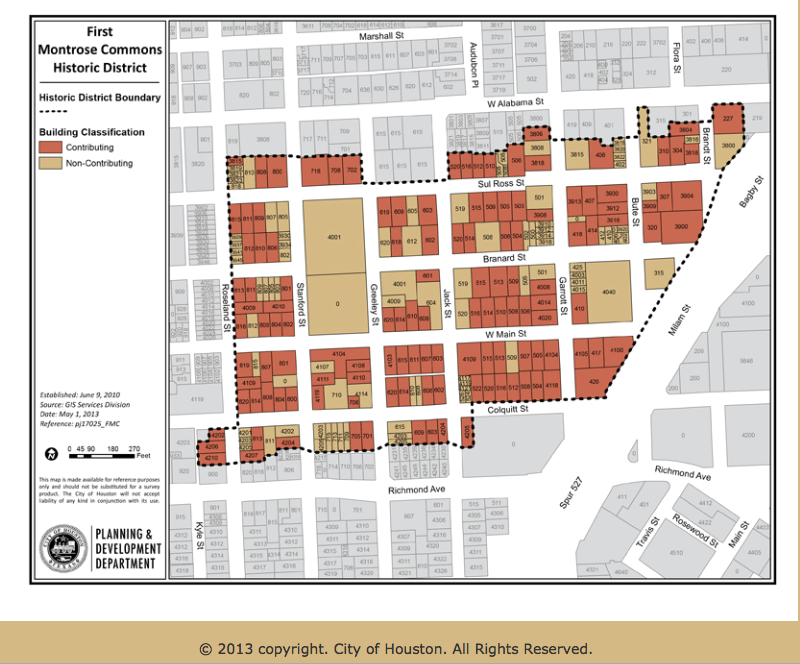 From the outset, James Bute planned for his addition to be “The Most Fashionable District of Houston” and sold land there in Quarter Blocks for $750 to $1,800 per lot. Original deed restrictions from 1917 required significant setbacks and restrictions on the construction of fences, and prohibited the construction or operation of businesses within the interior of the neighborhood. One of the most important features of the Montrose Addition were its grand boulevards designed with esplanades, including Lovett, Montrose, Yoakum and Audubon Place Boulevards. The intent was for larger mansions of the most prominent citizens of Houston to be built along the beautiful esplanades in Montrose, including Link’s own home on Montrose Boulevard. Edward Teas, Sr., who later founded Teas Nursery, helped plan and landscape Montrose Place, as the area became known. The homes and buildings in First Montrose Commons reflect the architectural styles that were in vogue in Houston and across the country during the neighborhood’s period of development. The styles of architecture found in FMC: Bungalow, Prairie, Mission Revival, Colonial Revival, Queen Anne, Cape Cod and Art Deco as well as the Craftsman style, which is the most prevalent. House plans could be purchased from Sears Roebuck & Co. for $8 to $12. Link, however, built his own home designed primarily not to resemble any other style popular at the time. Today, only three of First Montrose Commons’ original quarter-block mansions remain: the Hofheinz House, at 3900 Milam, the Lucia House at 3904 Brandt, and the Milam House at 4100 Milam. Both the Hofheinz House and the Milam House have been restored and are currently occupied by businesses sensitive to their histories. The Lucia House has been beautifully restored and is residential. All three now face a 30-foot high wall of concrete from their grand front porches. A 1909 advertisement in the Houston Daily Post described the Montrose neighborhood as follows: “The most fashionable district of Houston…between Westmoreland and Main Street, the South End (streetcar) line passing through it. It is fifteen minutes ride from the center of the city. Cars run every seven minutes. It is convenient to two of the best schools in the city. When the original Montrose Addition was platted in 1911, it was a purely residential neighborhood. Over the years, however, commercial and institutional encroachment has been so pervasive that these few blocks, now known as First Montrose Commons, represent one of the last remaining residential enclaves within the area. Like many inner-city neighborhoods, greater Montrose suffered during federal urban renewal in the 1950s and 1960s. The construction of Spur 527, which opened in 1962 as the new rerouted U.S. Highway 59, required the complete destruction of more than half of the Bute Addition’s housing stock. Nonetheless, a large number of historically contributing homes remain that serve to illustrate Houston’s rich entrepreneurial heritage. Incremental improvements initiated by residents, organizations, and alliances began in the 1970s. Change accelerated in the late 1990s when the neighborhood was discovered by new residents moving to Houston and also as a result of $2.6 billion in downtown revitalization and reinvestment. In 1994, residents formed the First Montrose Commons Civic Association with the mission “to protect and enrich First Montrose Commons by encouraging neighborhood pride, communication, advocacy and vigilance.” FMC boundaries are Richmond Avenue on the south, Spur 527 on the east, West Alabama Street on the north and Montrose Boulevard on the west. The Historic District designation has served FMC well. Homes cannot be demolished without permission from the Historic Preservation Office. We have seen restoration of several houses that were at first deemed uninhabitable. There are new homes and they are built with the required setback from the street, helping to maintain the integrity of the area. And, your civic association is still actively pursuing several projects. All of these can be achieved with the help of the good neighbors in FMC.